Zzounds DOD GS30 - The GS30 from DOD is loaded with the features that will enable you to handle any situation. The 7 Authentic Amp/Guitar Models will fill your stage or rehearsal space with the sounds of truckloads of equipment, all encased in one rugged, easy-to-carry chassis. 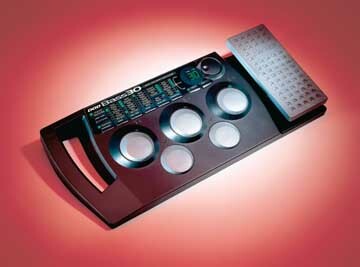 A studio full of processing power is at your feet, with 12 Fully Programmable Digital Effects. Learn your favorite solos note for note, at your own speed, with the GS30's Learn-A-Lick and Jam-A-Long features. Throw in an assignable Custom Expression Pedal, and Chromatic Tuner, and you've got the kind of Heavy Machinery you need for Total Control. The question is, can you handle it?